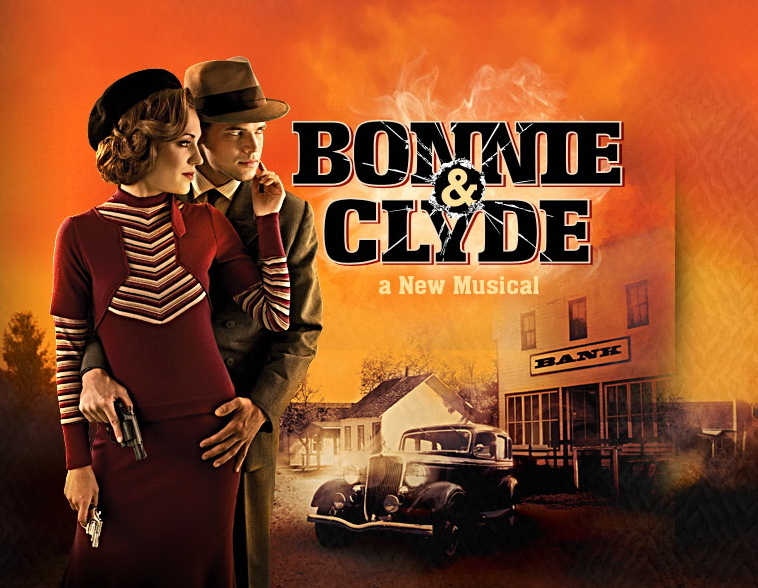 Bonnie & Clyde is a new musical that opened on Broadway last night. I was able to catch it last Monday when a friend and I decided to get rush tickets on a whim (partial view, but you don't miss much of importance). Now, if you're still taking Mr. Brantley's opinion into consideration (sorry for the snark, but if he can dish it, he can take it), please do yourself a favor and disregard his review of this show. Quite honestly I'm shocked at how negatively he reviewed it (I literally sat there at intermission imagining the good reviews they were going to get). Like I said, my friend and I went to the show on a whim. It was on my "To See" list, but not very high up. They just happened to be one of the few shows running on a Monday (their schedule has changed since opening). So, I was interested in seeing it, but my expectations were a little indifferent. Well, let me tell you, this is the best musical I have seen this season. Ok, it might actually be the first new musical I've seen this season, but that doesn't mean that the statement holds no weight. I left the theater thinking it a strong contender for Best Musical, and pretty adamant that Laura Osnes (Bonnie) and Jeremy Jordan (Clyde) should win in the Best Actress and Actor categories. As with any show, it has its faults, but I honestly can barely pinpoint them because the good outweighs any problems I had with the show. We all know the story of Bonnie and Clyde, but the world that this show created was so enjoyable to get lost in that I found myself excited to see how they were going to tell their story. Laura and Jordan are simply stunning in both their portrayal of the madly-in-love gangsters (their chemistry is HOT) and in each song they sang (either on their own, or even better, the duets!) of the charming 1930's Frank Wildhorn score. Both of their voices are to die for (so many unintentional puns...), and I don't want to ruin anything, but the end of the show was just about perfect. The best part is that the show continued to grow on me once I left the theater, and for days after. I have a few telltale signs that I enjoyed a show, and this one passed with flying colors. I left the theater humming the songs, I cried (more than once), and I even found myself wanting to go see it again (which was rather unexpected to be honest). I even Wikipedia'd (is that a word?) the real Bonnie and Clyde because I was so taken with their story on stage, and to my delight, found that the costumes in the show were based on real pictures of them, and reproduced to a T.
I wouldn't put Bonnie and Clyde in my "All Time Favorite Musicals" pile, but for some reason it really grabbed me and is holding on tight. And that reason is, IT'S GOOD. RUN AND SEE IT!